This book highlights the interconnectedness of integrity with philosophical history, leadership, managerial decision-making, and organizational effectiveness in a wide variety of contexts (e.g., time theft in organizations and family business). 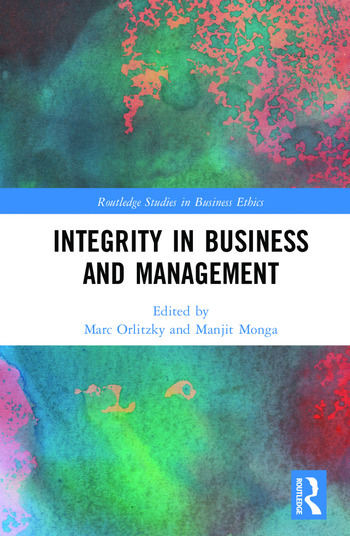 Well-known researchers in business ethics from all around the world reframe the literature on integrity in business and management and develop updated and more comprehensive models of integrity. Integrity in Business and Management connects integrity to both ancient thought and the modern philosophy of pragmatism, but also explains how contemporary societal trends may shape the way we think about integrity. The final chapter warns against oversocialized conceptualizations of integrity and argues for a clear differentiation between personal integrity and moral integrity. Aimed at researchers and academics in the fields of business ethics and organizational leadership, Integrity in Business and Management explicates and critiques prior models of managerial integrity in a wide variety of disciplines, covering economics, moral philosophy, business ethics, organizational behavior, sociology, history, and psychology and offers a helpful set of readings in advanced undergraduate and postgraduate courses of business ethics, corporate governance, corporate social responsibility, and leadership to stimulate discussions about personal integrity, moral integrity, and organizational leadership. Marc Orlitzky is Chair in Management, University of South Australia Business School, Australia. Manjit Monga is a lecturer in the School of Management at the University of South Australia Business School, Australia.